Refreshingly-cool, smooth & creamy for sparkling skin. For those of you who fell in love with our original soapless facial cleanser we are happy to keep the dream alive just for you. A super-yum, aromatic-fusion of french lavender, petitgrain & ylang ylang essential oils, grounded in a smooth & creamy, aloe vera juice base. Then, liberally accented with orange peel & ginseng root extracts. Sensatia’s original soapless facial cleanser effectively-yet-gently removes excess oil & dirt without stripping the skin of its natural oils. Use this dreamy-concoction twice daily for that I love life look on your face. 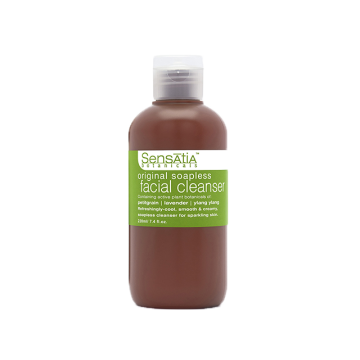 Water (Aqua), Decyl Glucoside, Aloe Barbadensis (Aloe) Leaf Juice, Vegetable Glycerin, Xanthomonas Campestris (Xanthan) Gum, Sodium Citrate, Triticum Vulgare (Wheat) Germ Oil, Citric Acid, Citrus Aurantium Dulcis (Orange) Peel Extract, Benzyl Alcohol & Benzoic Acid & Dehydroacetic Acid, Tocopherol (Vitamin E), Lavandula Angustifolia (Lavender) Oil, Citrus Aurantium Amara (Bitter Orange) Flower Oil, Averrhoa Carambola (Star Fruit) Extract, Triticum Vulgare (Wheat) Amino Acids, Cananga Odorata (Ylang Ylang) Flower Oil.